„Everybody is a stranger, almost everywhere“. Based on this fact, Sarah Vanhee has put together a lecture-performance „Me and my stranger“, shown in the garajistanbul in the idans-Festival. The Belgian theatre-maker and performer has had good ideas of how to treat the topic in many different ways: She does not only show street-interviews with both people from Ghent, some from there originally, some from another country, and treats the political part of the question, but also brings the topic to a scientific level when talking about a strange organ or the virus being a stranger in our body. She uses documentary with Jean-Luc Nancy talking about foreigners as well as Pasolini´s film „Teorema“, exempliying the attraction of a stranger. She uses a letter by a soldier, writings by philosopher Hanna Arendt, photos of horrifying frontier-fences. And she makes us identify with her when talking about feeling like a stanger in a group of people you have the impression you don´t belong to. Nevertheless, the performance remains too well-educatedly done, Vanhee seems not very secure and arranging many parts without connecting them, not presenting feelings to experience and share, on the whole a mostly boring lecture giving you the impression that you have seen it all before. Two dancers doing a solo, one an elegant musical-dance-combination on a penetrary, crazy hip-hop-song by Fatboy Slim done in 2001 in a hotel, the other one a silent piece done 23 years before with modern dancer Trisha Brown on an empty stage, formed mostly out of swinging legs and head movements – and still „Water Motor“ by Babette Mongolte from 1978 and the Fatboy-Slim-Video „Weapon of Choice“ by Spike Jonze have something important in common: They both suprise and deal with what was contemporary in the days of their making, adding a new idea to their genre. In the case of „Weapon of Choice“, director Jonze surprises the audience in various ways: By having a hip hop video done in a luxury hotel and especially by having Christopher Walken, known for his devil-parts in many Hollywood movies, who is in the beginning sitting in his chair like the Godfather, dance Broadway-style-jazzdance and Michael-Jackson-style-hip-hop-moves on lobby tables, escalate, suitcase carriere and many more – and not only that, but even bringing it up to the level of a science fiction movies by having him fly around the hotel after having danced energetically like a young one. Mongolte and Brown also suceeded in surprising the audience in their days by bringing in moves which seem unintended, without structure, recognizable but still in a way new and strange. Trisha Brown, on an empty stage and without music, jumps, turns, does many release movements, but without any intention to create a narrative piece. With both „Water Motor“ and „Weapon of Choice“, the spectators may wonder very much, what might have happened before the actual action happens and what made the dancers to do these movements. Both leave this open and the audience is invited to create its own pre-story. Can you show me a little bit of what your dance is like? 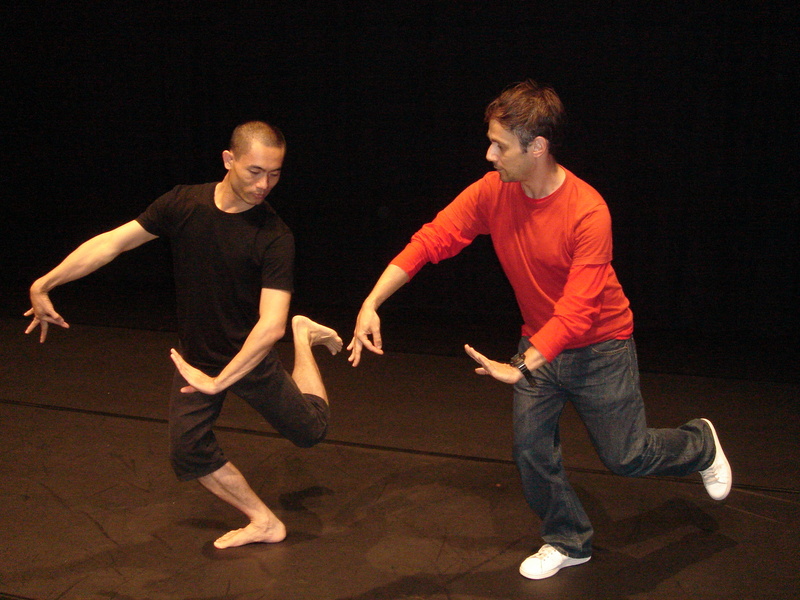 This question, posed once by the French choreographer Jerome Bel to the Thai dancer Pichet Klunchun, then vice versa, is the base of the piece “Pichet Klunchun and Myself” by Bel. The two performers sit on chairs profile to the audience, facing each other, Bel with pen and paper in hand, when asking Klunchun to present first himself and then elements of Khon dance. Klunchun, dressed all in black and barefoot, rises his foot and stamps loudly, presents arm movements, explaining the differences between the port de bras of the four main characters when being asked by Bel. While watching, Bel often frowns, looks and asks naively as a child, sceptically. Together with Bel, the audience learns about how to show grief and death on a Thai stage, walking slowly and drawing tears on the face with the finger. The spectators are shown how to distinguish between prince and princess and how the feeling „relaxed“ is presented through a headmovement forming an eight. Bel asks the questions we would probably pose ourselves. Playfully, Klunchun includes Bel into his presentation when having him being the one to die when Klunchun shoots an arrow in his direction. After an hour, the vice-versa-version starts. Now it is Klunchun´s turn to question, what are strong elements of Bel´s performances. When Bel shows him as scene in which he does not do more than looking at the audience, Klunchun openly expresses his disappointment. Bel goes on describing that he does not want to represent something on stage, but to show the audience reality. When then showing death on stage in his interpretation, Bel does karaoke with „Kiling me softly“ and finally drops on the floor. To this, he can relate, says Klunchun, when telling about his mother dying softly. Throughout the piece, Bel and Klunchun also aim to point out the differences in their cultures, finding very little parallels like the role of the king in the development of the dance, but huge opposite opinion as on getting married before having a child. Still, most of the time is dedicated to exploring and trying to understand the other´s style. Slow Asian movements with flexed hands, angled legs and dynamic jumps: Not so uncommon for a Thai dancer. But when Pichet Klunchun in his piece „Nijinsky Siam“ perform these, he does not do so in the first place to show his own country´s styles, but to reconstruct the look the famous Ballet-russes-dancer Vaslav Nijinsky had on them 100 years ago. The audience learns that after having heard of a Siamese dance company having performed in Europe, Nijinsky created his famous „Danse Siamoise“, of which nowadays photos are the only thing to remain. With these, which are also projected on stage, Klunchun has not done a pure reconstruction, although it also is historically interesting, but, as he tells his audience via writings on the back wall of the stage, wants to give back a soul to Nijinsky´s famous solo. Inspired by what is to be seen on the photos, he does his own solo in the end of the performance. But he does even more than that. By projecting photos of Nijinsky fading into one another, he makes the Russian dancer kind of dance as well. And he has two other Thai dancers with him, Sunon Wachirawarakarn and Padung Jumpan, who support him to bring to stage what he thinks Nijinsky had been inspired by 100 years ago. 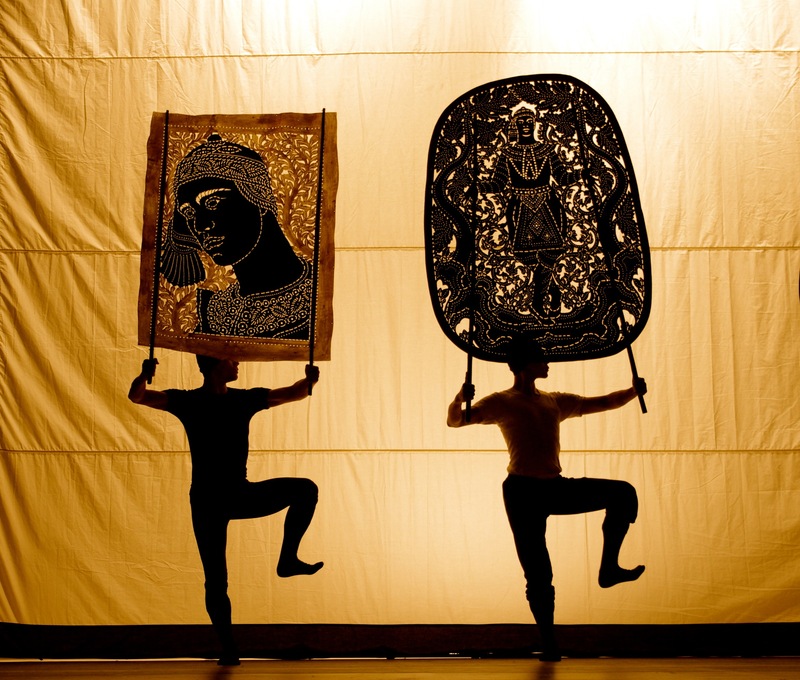 So „Nijinsky Siam“ does not try to reconstruct a historical piece, but brings it on one hand back to its origins by having filtered the Siamese dances twice – once by Nijinsky, once now -, and on the other hand creating something new with all respect to the Ballet-russes-creator. A young Serbian woman carrying a young German from the battle field, mutual singing of soccer-songs, mixed with patriot songs. Tito in children´s drawings and a certificate of ancestry. What do Serbs and Germans have in common after fighting against each other in several wars? In her performance „Will you ever be happy again?“, Sanja Mitrovic brings light to this question in various ways. Together with the German performer Jochen Stechmann, she has put together a piece with a very thought-out dramaturgy, many historical documents and a strong impact. She has already won the prestigeous Dutch BNG Young Theater maker Prize 2010 for it. If it is through children´s games, their drawings (Mitrovic shows her 1st-grade-exercise-book with drawings like the first partisans, the first bombs, the first snow and a drawing of trees forming the name of Tito in the sky) or their songs – the audience can experience intensly how the fighting for the own country, patriotism and hate of the so called enemy infiltrated even the smallest. This is very strong, but the performers, who speak both their mother tongue, do not contend themselves to that interesting part. They switch from giving the pioneer-oath to bombing one another with paper bullets, Mitrovic presenting her body provocatively. Also she is bringing up a very delicate topic, when she asks if the audience loves her more with the Dutch passport than with the Serbian one. Mitrovic and Stechmann need very little to present such a strong work. They present their documents of the past, which they draw from cardboard boxes, in front of a camera, the image is then projected to the back wall of the stage. They present the horrors of the Nazi Regime in Germany through a certificate of ancestry, the inflation of money in Serbia with banknotes of 5 billion Dinar. The fall of the wall is brought in through live quotations from this time, the difficult life of Serbs trying to come out of their country through a photo and letters by a friend who managed to escape. By this, the performance is both very personal and generally valid. The individual case speaks for a whole people. Mutually sang soccer songs finally unite the former enemies, but still, the peace seems limited. When Mitrovic and Stechmann at the end recieved lots of applause, the light went out. Planned to show again a war situation after the final reconcilation? Actually electricity went down in the whole district of the garajistanbul, where the performance took place. But still, the impression of only limited freedom and peace remains. Always wanted to feel like the rich? Always wanted to see an unbelievably luxurious flat? Anat Eisenberg and Mirko Winkel are going to take you: In their performance „Life and Strive“, which they do until 23rd of October every day at 2pm, you kind of become a wealthy person observing one of the most expensive houses in Istanbul, maybe Europe. They make you pretend that you are interested in buying a 7.8-million-dollar-flat, talking with the sales manager and inspecting the flat. In order not to make sales managers too suspicious, they go to different luxury-towers being built in Istanbul at the moment. Obviously Eisenberg and Winkel want to show that we are all performers, from the sales manager onwards to ourselves. This piece at one hand shows acting in every day life. But on the other hand it is betrayal in various senses: We come to the meeting point willing to observe, not to be active, what then we have to be. Even more, we all betray the sales manager, part of the game is that during the whole excursion, everybody is often thinking about how he will react and if he will notice. In our case he was very cooperative and if he was suspicious, he did not show. He was friendly until the very end, answered all questions, tried to present the flats in all details. Poor guy, one has to think, making so much effort and maybe assuming that these not very rich looking persons will most likely never come back to him to buy….and still he has to stay in his „performance“. Still for me the difficult thing about this performance was that is was none. Although it was very interesting to see this building from inside, to enter to this science-fiction- world, which all this seemed to me, to think about questions one could ask in order to come up to the part one has to play, and although it was quite enjoyable to see the view from the highest building of Istanbul, for my maybe too limited definition of art, this wasn´t. But thanks for taking us anyway.